Thanks to Dr. Shafinaz Hussein and Dr. Huifei Liu, Staten Island University Hospital, New York (USA), for contributing this case and the discussion. To contribute a Case of the Week, follow the guidelines on our Case of the Week page. (1) We have now converted all of the main Chapter pages, and have started converting the 7000+ topic pages into our new "Phase 2" format. Each page will have a common header and footer, and a navigation "breadcrumb" at the beginning and end. The topic pages will also have a more consistent format, and each topic page will have a Table of Contents at the beginning. We are also removing the sometimes obnoxious Google ads. Read more. (2) Our Feature page for September is Antibodies / Biomarkers, and highlights our advertisers Advanced Cell Diagnostics, Inc. (ACD) and Ventana Medical. 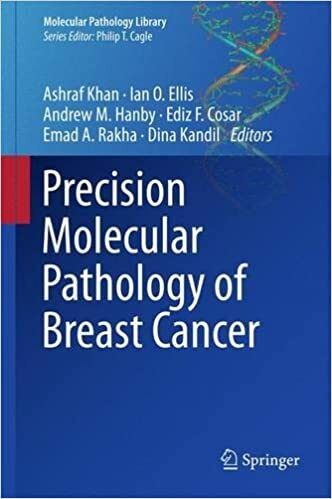 It also contains an original short article, "Biomarkers in Proteomics: Deciphering Protein Signatures", by Jaleh Mansouri, M.D. (3) The number of subscribers continues to increase for our email newsletters. As of 3 September 2015, we have 6010 subscribers to the Case of the Week email, 4163 subscribers to the Jobs, Fellowships and Conferences email and 3119 subscribers to the Website News email. Click here to review your email preferences. (4) Thanks to J. Manuel Gamboa M.D. and Steven Alexander Mann, M.D., our newest members, for supporting PathologyOutlines.com. See our Membership page for a list of all members, and visit our Individual Membership page to see why you should become a member too! (5) Visit our Blog to see recent updates to the website. A 44 year old man with diverticulitis presented with increasing abdominal discomfort and left upper quadrant pain. Abdominal and pelvic CT showed a splenic mass measuring 9.7 x 8.5 x 7.8 cm. Although the mass was unchanged from imaging studies 20 months prior, a splenectomy was performed. The enlarged spleen weighed 1275 g and measured 25.0 x 14.0 x 6.5 cm. 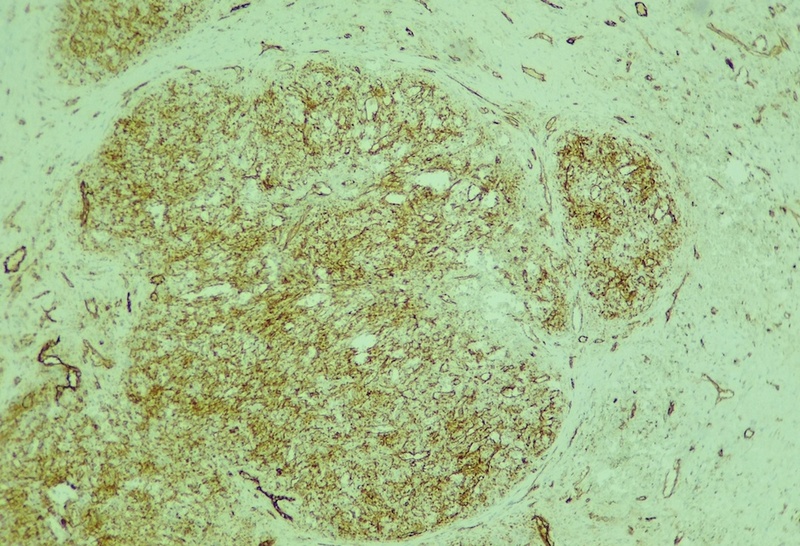 The splenic capsule was intact but showed an area of yellow-tan discoloration measuring 12 x 7 cm. Sectioning revealed a circumscribed, bosselated, firm, tan colored mass measuring 8.5 x 7 x 6.5 cm. 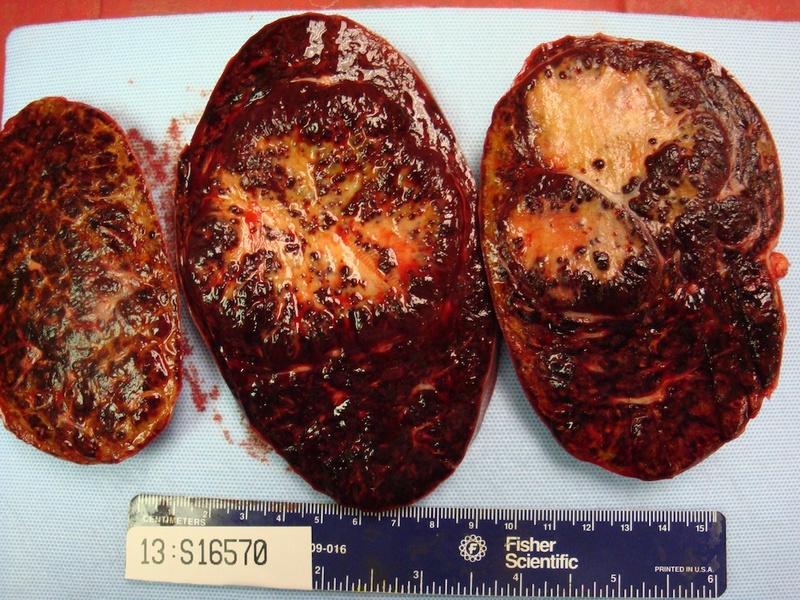 Its cut surface showed numerous variably sized red to brown nodules embedded within tan-yellow fibrotic tissue. No necrotic areas were identified. Sclerosing angiomatoid nodular transformation (SANT) of the spleen is a rare benign vascular lesion of the spleen with characteristic morphologic features, distinctive immunophenotypic profiles and benign clinical outcomes. It is more common in women, usually within the age range of 30 to 60 years. 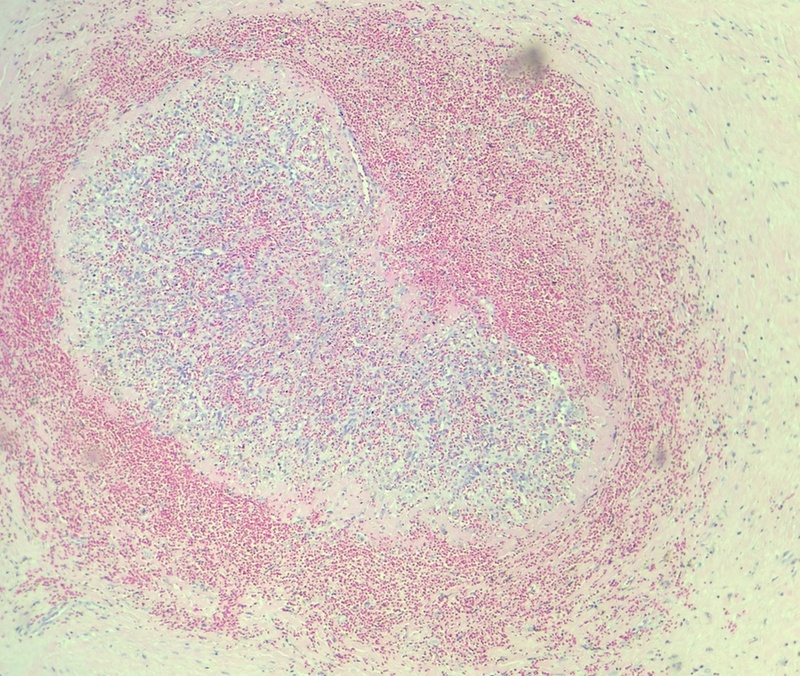 Microscopically, at low magnification, SANT shows multiple angiomatoid nodules of variable sizes and shapes surrounded by fibrosclerotic or fibromyxoid stroma. Some nodules, especially smaller ones, can be surrounded by multiple layers of concentric collagen fibers. 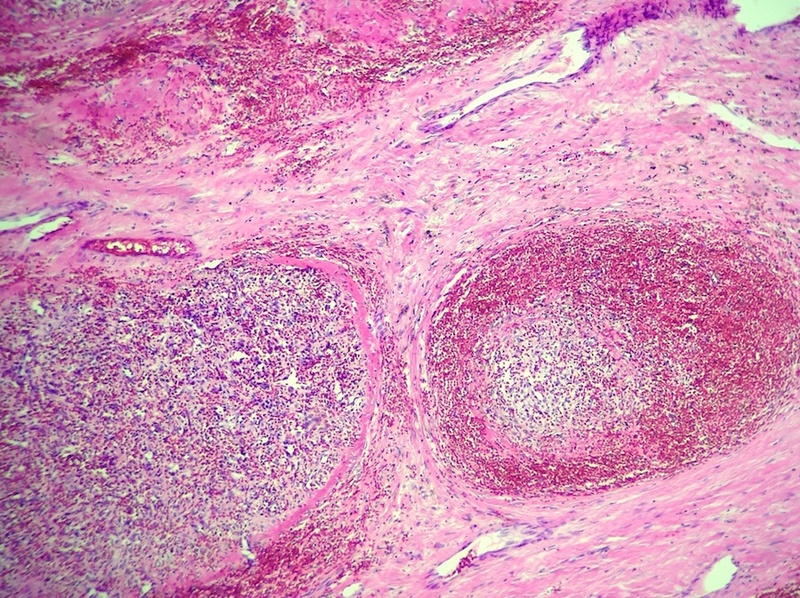 At higher magnification, the nodules show vascular spaces that are slit-like, round or irregularly shaped and lined by plump endothelial cells. Numerous red blood cells are present within the small vascular spaces. 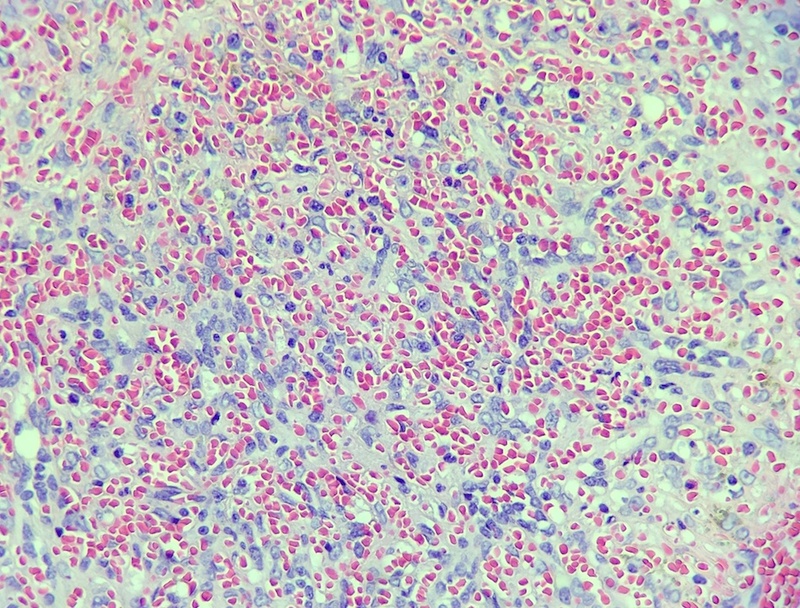 At the periphery of the nodules, extravasated red blood cells, exudated fibrin deposits or scattered spindly cells resembling granulomas can be seen. 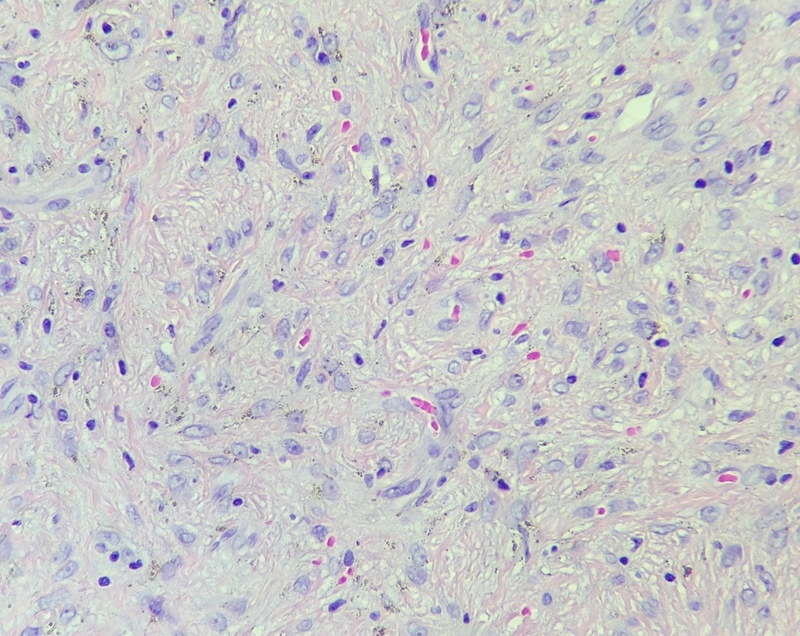 The internodular stroma consists of variably myxoid to dense fibrous tissue with scattered plump myofibroblasts, plasma cells, lymphocytes and siderophages. 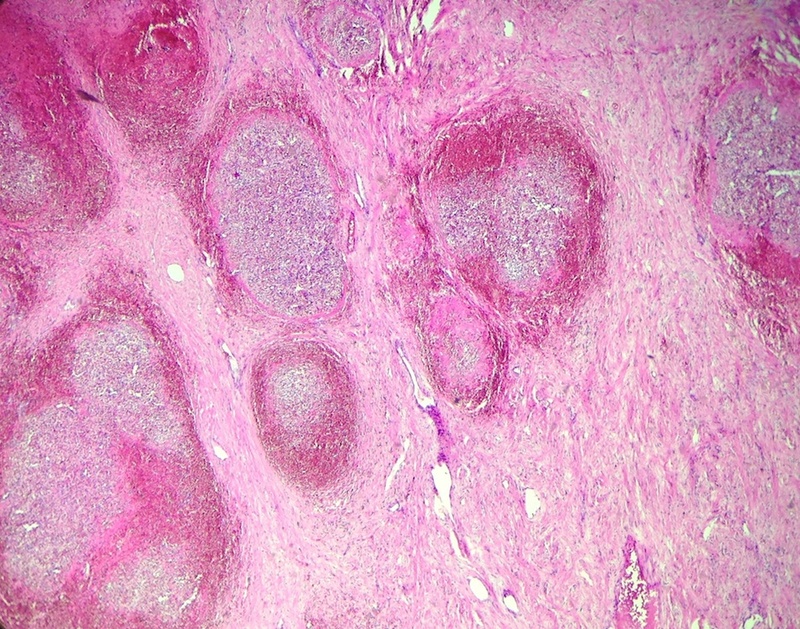 Atypia is minimal and mitotic figures are extremely rare. 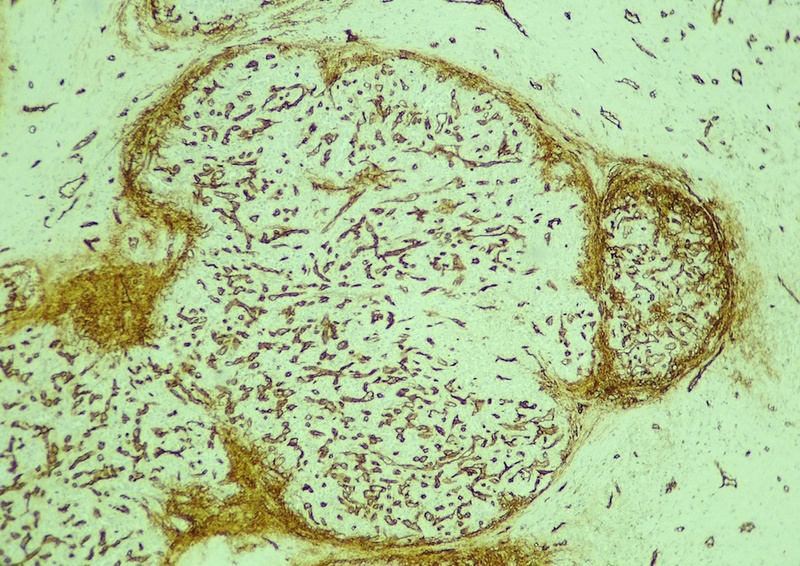 Immunohistochemical staining reveals three types of vessels within these angiomatoid nodules: CD34- CD31+ CD8+ sinusoids, CD34+ CD31+ CD8- capillaries and CD34- CD31+ CD8- small veins. 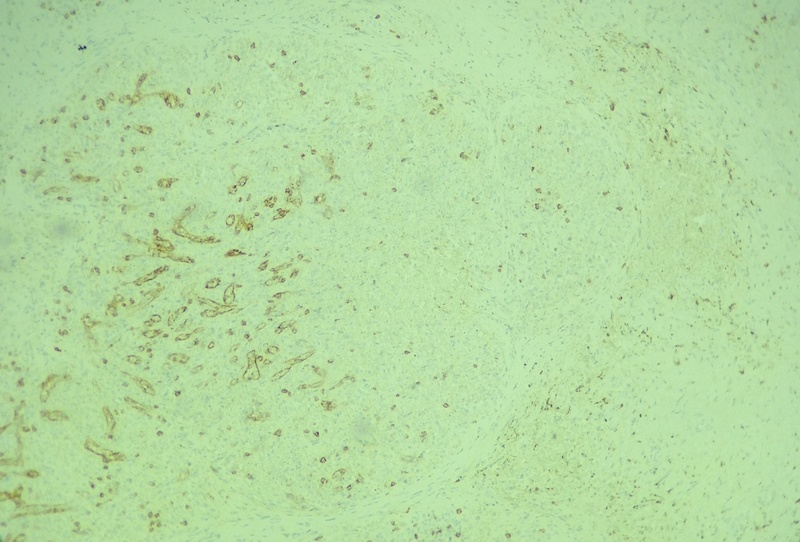 All vessel lining cells are negative for CD21 / CD35 and CD68. 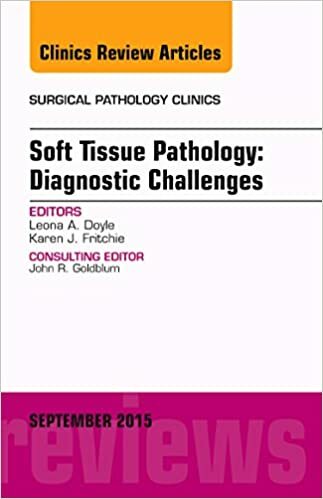 The differential diagnosis includes hemangioma and littoral cell angioma, which are the two most frequent splenic vascular tumors. Both lack the distinctive histological features of SANT and both contain only a single type of blood vessel. The vessels in hemangioma are CD31+ CD34+ CD8-, while the monotonous blood vessels of littoral cell angioma are CD31+ CD34- CD8- CD21+ CD68+. Other splenic vascular tumors to consider include 1) lymphangioma, which is mostly cystic with D2-40 positive lymphatic endothelium, 2) splenic hamartoma, which lacks the nodular growth pattern of SANT and shows a single type of CD31+ CD8+ blood vessel, 3) hemangioendothelioma, which has variable CD34+ vascular endothelial cells with mild to moderate cytologic atypia and 4) angiosarcoma, which shows marked cytologic atypia, brisk mitoses and invasion. Overall, the morphologic patterns and distinct immunophenotypic features of the three different vessel types are helpful in distinguishing this benign entity from other splenic vascular tumors.